We had a chance to get a small taste of Paris when we vacationed in France a few years ago. That trip was mostly in Southern France with a couple of days at Disneyland Paris which is about 30 miles from Paris. We took a bus tour from Disneyland to Paris one day and rode past a lot of the biggest sights. We had only two off-the-bus excursions; one at the Eiffel Tower and one at the Louvre. The tour included tickets to go up to the first two levels of the Eiffel Tower but the stop at the Louvre was far too short to allow time to enter the museum. This tiny taste of Paris prompted our decision to spend a future vacation entirely in Paris but while we were checking airline tickets we found that the best rates included a layover in Dublin. Since Joyce has always wanted to visit Ireland, we scheduled the flights for a four day layover in Dublin before going to Paris. We planned to be in Paris for our 29th anniversary which made seeing the bridges with all the lover's locks a must do. Paris began to renovate bridges and remove all the locks shortly before our visit but as you can see in the picture above, there are still a lot of bridges they haven't removed them from yet. We saw a lot of locks with very recent dates and assume there is a rush for people to do this before all the bridges are redone. For housing we turned to airbnb. Jeff had read good reviews from other travelers who had used airbnb so we found an apartment flat in Dublin and one in Paris and booked them for our stays. Click the links above to read about our experiences in Dublin and Paris. Click the tab labeled 'Art, Sights, etc.' to see paintings, sculptures, fountains, palaces and other miscellaneous pictures we took that were not included in the Dublin or Paris tabs. 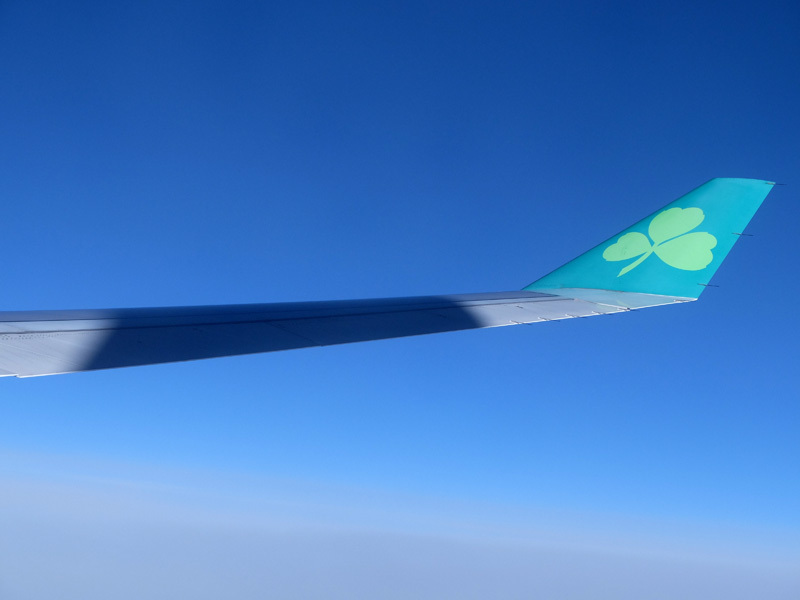 The Aer Lingus wingtip heading to Dublin. Copyright © 2015 Jeff & Joyce Oravec. All Rights Reserved.